Angela Dorothea Merkel, known as Angela Merkel is the Chancellor of Germany and srbagai seroang chairman Demoktatik Christian Union Party (Christian Democratic Union). Merkel is the son of Horst Kasner, a pastor from Berlin and Herlind Jentzsch, a teacher of Dazig who was born on July 17, 1954. In the year of his birth coincided with the placement of her father's duties to serve the church in Quitzow, near Perleberg, Templin so they should moved there to a village within 80 km from north of Berlin in the Republic Demikratik German Communists. He is a Member of the official youth movement led by the Free German youth while a student at East Germany. After that he joined the Academy of Science in the youth organization and become a member of the district board and secretary for agitation and propaganda. In 1973 he studied at the University of Leipzig and majored in physics. He then graduated from the University of Leipzig in 1978 and continued to work and learn at the center of the Institute for Chemical Physics of the Academy of Sciences to 1990 graduation with a doctorate in physics. After graduation he then worked in Quantum Chemistry. In 1989 he was involved in a democracy movement and join the party Demokratischer Aufbruch. He became deputy clerk biacara of the interim government before the reunification under the leadership of Lothar de Maiziere. He later became a member of the Bundestag in 1990 elections he served as Minister of the Environment and Security settings Nuclear Reactor in 1994 and bo a platform to build a career politknya. He is referred to as Kohl as "das Madchen" in his cabinet because he became the youngest minister and Kohl's protégées. He was first married in 1977 to a physicist, Ulrich Merkel which later ended in divorce in 1982. Later married again for the second time with a professor Joachim Sauer, a chemist at the University of Humboltdt, Berlin, 1998. His second marriage this was held without the presence of parents and companions. 1998 is also Kohl government was defeated in the election of 1998. He was later appointed to be the Secretary General of the CDU and she witnessed the victory of the CDU in 6 of 7 provincial elections in 1989 alone. On 10 April 2000, he served as Chairman of the CDU Party replaces Schauble. The election he became Chairman of this opposition makes it quite well-known in the community as chancellor Gerhard Schroder opponents in the election of 2002 and the defeat of Stoiber, the CSU leader, he served as the leader of the conservative opposition in the lower house of the German Parliament, the Bundestag. 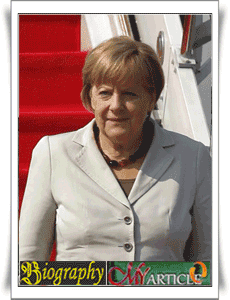 2005 election official Merkel became Chancellor of Germany by winning 614 votes.